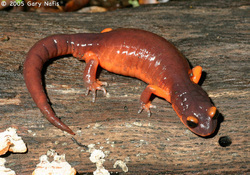 The Ensatina Salamander is sometimes found in chaparral, but is more commonly found in redwood forests. They range from 3-6 inches in total length. Females usually have shorter and fatter bodies than males. They are most active on rainy or wet nights. They can drop their tail when threatened, in order to escape predators. They eat a variety of invertebrates including worms, ants, and beetles. Ensatina salamanders are found under rocks, logs, or other debris. There are no concerns regarding the conservation of this species. Its range stretches from Washington down to Baja California. 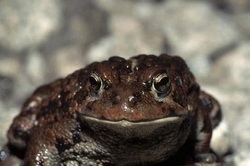 The western toad are most commonly found in riparian or deciduous forests, but the chaparral is a "marginal habitat" for them, meaning a small number can be found in the chaparral. They are active from January to October. At low elevations they are nocturnal, but at higher elevations they are diurnal. They require open water for breeding. They are between 5.6-13 cm long. They eat various insects. They are listed as "Near Threatened" on the IUCN Red List of Threatened Species. A western toad call can be heard below. Its distribution is from British Columbia to Baja California. Arroyo toads range form 2-3 inches long and are olive green or brown.The have a v-shaped white stripe on their heads. Their bellies are white and sometimes speckled. Adult arroyo toads are nocturnal, hiding in burrows during the day. However, young arroyo toads are diurnal. They eat a variety of insects, most of which are ants. 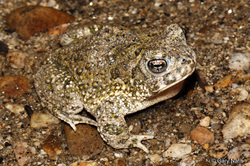 Arroyo toads are endangered due to invasive species being introduced to their environment. They typically live near sandy riverbanks and forested areas with oaks and cottonwoods. They breed in shallow water as they're young tadpoles must live in slow moving streams. As a result, they are rare to find in the chaparral region. In addition, they are endangered, making them even harder to encounter; visitors must be very lucky to find one. Their calls can be heard below.